Судя по history, актуальность ссылок активно поддерживается. 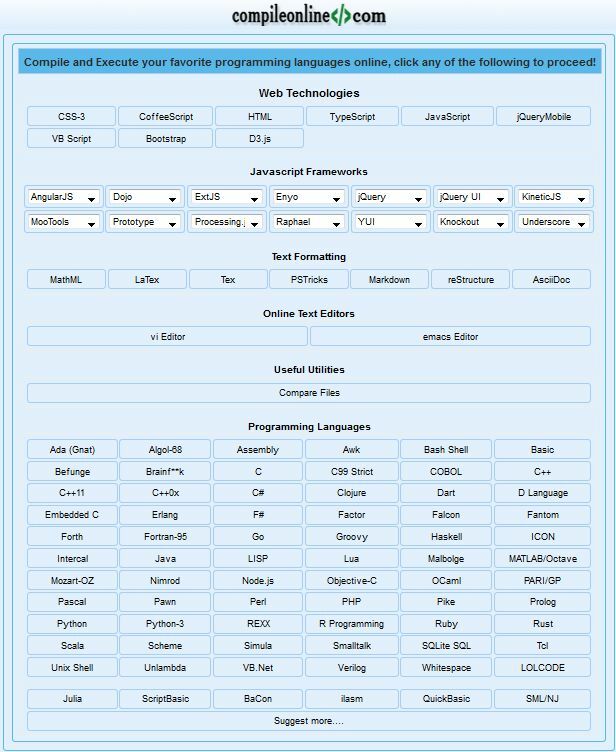 Compile and Execute your favorite programming languages online. Programming languages: Ada (Gnat), Algol-68, Assembly, Awk, Bash Shell, Basic, Befunge, Brainf**k, C, C99 Strict, COBOL, C++, C++11, C++0x, C#, Clojure, Dart, D Language, Embedded C, Erlang, F#, Factor, Falcon, Fantom, Forth, Fortran-95, Go, Groovy, Haskell, ICON, Intercal, Java, LISP, Lua, Malbolge, MATLAB/Octave, Mozart-OZ, Nimrod, Node.js, Objective-C, OCaml, PARI/GP, Pascal, Pawn, Perl, PHP, Pike, Prolog, Python, Python-3, REXX, R Programming, Ruby, Rust, Scala, Scheme, Simula, Smalltalk, SQLite SQL, Tcl, Unix Shell, Unlambda, VB.Net, Verilog, Whitespace, LOLCODE, Julia, ScriptBasic, BaCon, ilasm, QuickBasic, SML/NJ. Useful service to beautify web-related code before analyze/editing.